Objective: To identify clinical oncological characteristics and overall survival in patients with seminoma and non-seminoma germ cell testicular tumor. Methods: Retrospective study in patients with seminoma and non-seminoma germ cell testicular tumors, attended at the Central Military Hospital CRL LUIS ARIAS SCHREIBER, from January 2004 to January 2014. Study variables: tumor markers, stage and treatment. Finally, global survival was realized. 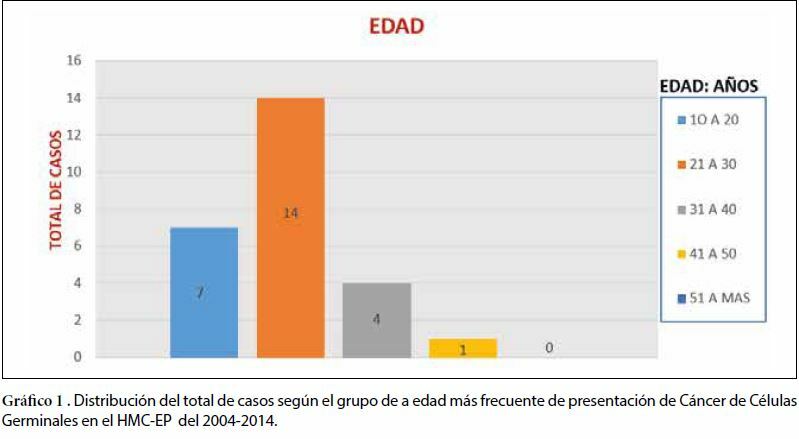 Results: During the study period from January 2004 to January 2014, a total of 26 patients were registered with histopathological diagnosis of germ cell tumor between seminomas and nonseminomas. Histopathologically, the most frequent type was germ cell tumor was non-seminoma type (69.23%), 33% of its variants were mixed tumor type, followed by pure choriocarcinoma with 28%, pure embryonic carcinoma 17% , 11% yolk sac and 11% pure teratoma. Seminoma-type germ cell tumors (30.77%)Within its variants, 62.5% of these were classic seminomas and 37.5% of multinodular seminoma.During the observation period of 179 months with an average of 106 months and a median of 101 months theOverall survival rate at 5 years was 92.3%. (p <0.05). Conclusion: The present study showed a good prognosis. Survival is attributed substantially to accurate diagnosis and effective treatment. With regard to the management of this neoplasia, testicular tumor of germ cell seminomas and non-seminomas must be multidisciplinary.